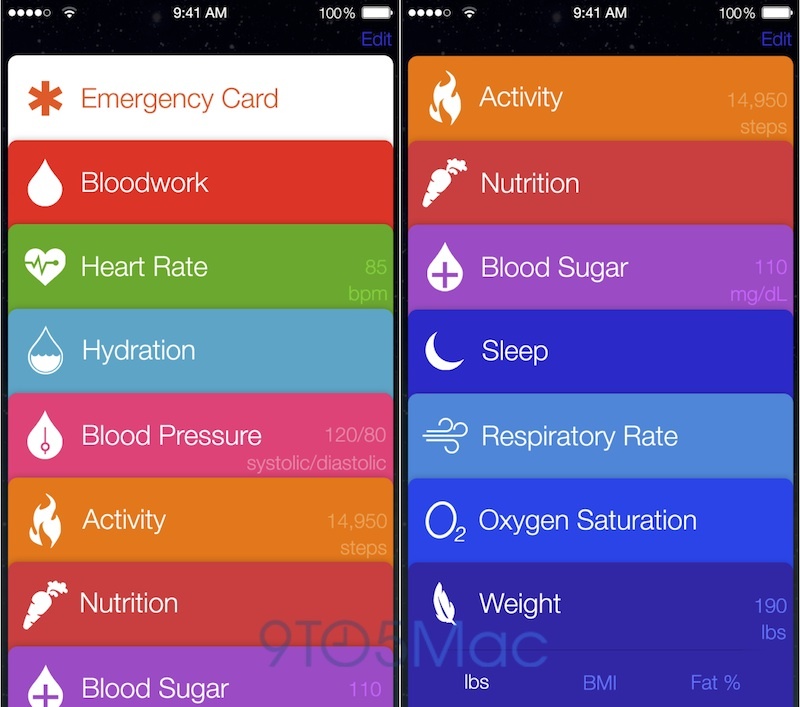 Apple's rumored "Healthbook" app for iOS 8 may be the company's first big push into the current health and fitness craze that is being fueled by wearable technology, and a new report from 9to5Mac offers a look at what users can expect from the app as well as a few renderings of the app said to be recreated from actual screenshots. The renderings show a Passbook-inspired user interface with cards for different heath and fitness data points, with the app able to keep track of vitals mentioned in previous rumors such as heart rate, hydration, blood pressure, physical activity and more. Notably missing from the renders are parameters for other topic such as stress and pregnancy tracking, which had been suggested in a separate report from MobiHealthNews last month. A big chunk of the Healtbook app will be dedicated to measurable health parameters such as blood sugar levels, oxygen saturation, bloodwork values and more. The blood sugar tracking would let diabetics enter their daily or weekly glucose levels and track changes over time, while the bloodwork tab would allow users to enter the results of routine bloodwork tests that are used to screen for overall nutrition as well as heart, kidney or liver disease. When combined, these parameters will provide the user and their doctor with a snapshot of the person's overall health at any given time. Another focus of the app is fitness, with the ability to track activity levels, nutrition, and weight changes over time. Data in these tabs would provide detailed analysis of calories burned, BMI, body fat percentage and more. This section, which also includes sleep tracking and hydration measurement, provides the user with an overview of their fitness and allows them to monitor any changes over time. The mechanisms by which the app will retrieve this health and fitness data, especially the more difficult to measure vitals such as hydration and blood sugar, are not clear, although it is likely the app will utilize some combination of the iPhone's M7 motion coprocessor, third-party devices, third-party apps and Apple's own wearable devices such as the rumored iWatch. Apple has been hiring health and fitness experts to build out its iWatch team, and is rumored to be using this expertise in the development of its first wearable device. The iWatch is rumored to launch later this year, and Healthbook should debut as part of iOS 8 in a similar timeframe late this year. I'm just curious how the new glass will hold up when you step onto your phone to get your weight. millions of health app developers suddenly cried out in terror and were suddenly silenced. Another useless and irremovable icon added to the iOS homescreen. I'm really into health and fitness (had various health issues) - plus been a Nike FuelBand owner for 2 years. Nail all this, Apple, and I'll be back with you guys in 6 months time. I absolutely cannot wait for this (But I must). Assuming the new iWatch tracks all of this, this is one of the coolest things I've ever seen. This and the Original 9to5Mac article are very strange. These are simply "recreations" or some designer's mockups...albeit nice and detailed. but this headline and the original and the articles themselves make it sound as THESE are official. I really doubt this will be the interface they use. It's clumsy and awkward to have to check each card for data and stats. A summary of all the latest biometrics would make more sense to me. This setup looks painfully hard to use.